A few weeks ago I headed down to Porto Alegre to help out with a Mozilla hack day after BrazilJS. I was around at the BrazilJS event as well, but I only fielded the odd question as most attendees were off at the awesome talks (it was a single-track conference — my favourite kind). As a result, I didn’t exactly know what to expect from the hack day, seeing as it was to be a mix of BrazilJS attendees and folks who heard through the grapevine there’d be a day of hacking. It was also my first time in Porto Alegre (and in Brazil, for that matter) so I had nearly no idea what to expect of the coding scene there. Well hot damn I was impressed. I was sent to Brazil pretty last-minute, so speaking at BrazilJS wasn’t possible. But I did get to give a brief talk after Brendan Eich showed off BananaBread — which was basically the perfect segue ever. Mozilla’s WebGameStub makes this especially easy; it’s a simple game loop plus a <canvas> tag that lets a developer get their own 2D game engine started with no extra boilerplate. 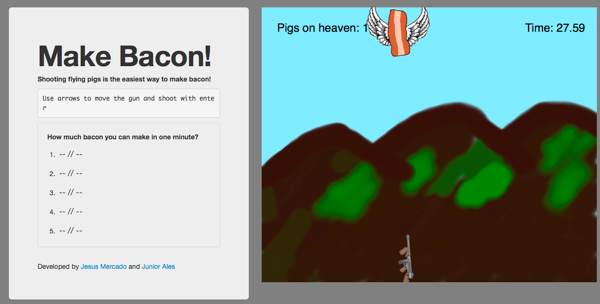 It even includes a demo game that you can use to bootstrap your own game (which is how yours truly got started). Another Mozilla web developer, Fred Wenzel, was able to build a snake clone and ship it to the Mozilla Marketplace in an afternoon. I added iOS support and touch events easily. Turns out: this stuff isn’t hard at all! So after I stood in front of a decent-sized audience and spoke in weird English for half an hour to a Portuguese audience, we got hacking. A shot of some of the hack day attendees at my talk. Hundreds — sometimes even dozens — of people storming your wifi just doesn’t work. We got stuck with pretty slow connections for everyone, which meant I was fielding a lot of questions and folks were having trouble getting access to GitHub and the awesome Mozilla Developer Network. I was worried that between my very English help and the crummy wifi it wouldn’t be a very productive hack day. With about three, maybe not quite four hours of hacking behind us, we announced that it was demo time. There was even a modified version of the demo game included in WebGameStub to be a somewhat Sisyphean version of the original. I got a bit of a kick out of that one. Even vegans should find this funny. I did a short demo of the aforementioned Serpent and our own flux-game — the result was an afternoon of games including more than just the highlights I picked out. The takeaway for me was validation of what I was saying to all the hackers in Porto Alegre: you can building something fun, something unique, and something genuinely cool with the APIs and tools provided by the web. So stop building to-do apps and make the web a more exciting place!